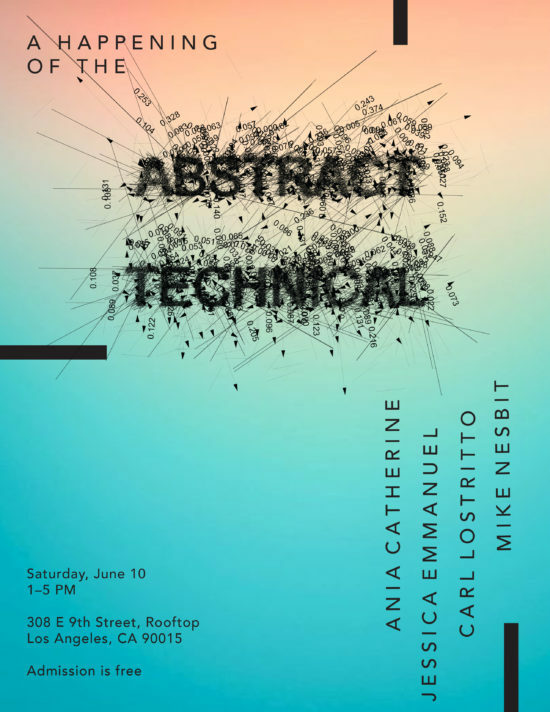 Two artists who practice within and around the discipline of Architecture–Carl Lostritto (Assistant Professor, Architecture) and Mike Nesbit–exhibit and perform a live studio session of their ongoing collaboration. Both Lostritto and Nesbit use their work to provoke architectural questions via structured procedures. In Lostritto’s work, he controls algorithms in the domain of drawing. In Nesbit’s work, he controls matter in the domain of painting and printing. Lostritto and Nesbit have consistent conceptions of the relationship between architectural process and architectural content. However, their conception of time–the duration of production, the speed at which they move during production, and the presence of time captured in their work–is in stark contrast to one another. To heighten this contrast, and in recognition that a true collaboration must involve not only sharing content, but a sharing of the time and space of production, the visual artists are joined in this event by two choreographers, Ania Catherine and Jessica Emmanuel. The choreographers will improvise a dance performance amongst the art production as they bring their own agendas and nuanced understanding of body, space and time.